Hull’s school that means business has staged a unique event to give its students the edge in claiming apprenticeships with the city’s leading employers. Around 260 students from Ron Dearing University Technical College (UTC) attended the school’s first Apprenticeships Expo, aimed at informing them about sought-after training opportunities with the school’s employer partners. The Apprenticeships Expo featured Ron Dearing UTC Founding Partners the University of Hull, KCOM, RB, Siemens Gamesa and Spencer Group and Major Partners Arco, BP and Sonoco Trident. The businesses told the students about the apprenticeships they will have available from next summer and also their likely future recruitment plans. The event was timed just before the companies advertise their apprenticeship opportunities to Ron Dearing UTC’s students, either exclusively or primarily, from January. 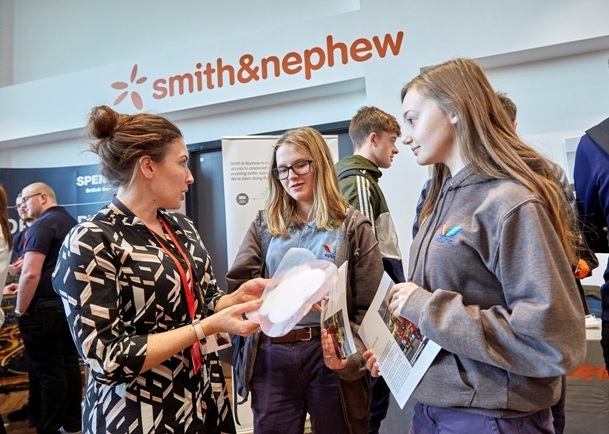 Students from Year 11 (aged 15 and 16) and Year 13 (aged 17 and 18) were also able to discuss these opportunities with representatives of each of the businesses during the event held in the school’s Smith & Nephew Conference Centre. The Apprenticeships Expo was the latest stage in a continuing programme of support for students aimed at ensuring they are fully prepared to apply for and secure apprentice positions with the blue chip companies who make up the school’s business backers. Neil Cavill, head of business improvement for Hull-based Arco, the UK’s leading safety company, said Arco was looking for Ron Dearing UTC students to fill apprentice software development and cyber security roles. He added: “This is part of our drive to become the most digitally-enabled and forward-thinking organisation in our sector. “What is really unique about Ron Dearing UTC is that the students learn the digital skills needed in business today. That means the students we have met at this event talk the language we use in our organisation, from a technical perspective. Ron Dearing UTC Principal Sarah Pashley said around 50 apprenticeships were expected to be available next summer with the school’s employer partners, mostly for students leaving at 18, but also some for 16-year-old school leavers. She said: “This event was all about letting the students know about the apprenticeships that will be available from January, so they can make their applications on an informed basis. “It’s a really valuable opportunity for both Year 13 students, who will be leaving us next summer, and the Year 11 students, although most of them will be staying on into sixth form. For the Year 11s it helps them choose the right courses in sixth form and will keep them motivated because they have a very clear goal to aim for.